Not to be confused with Yashoda. 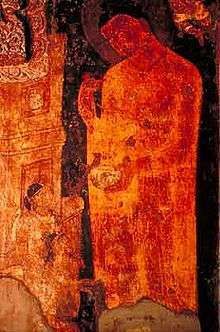 Yaśodhara was the daughter of King Suppabuddha, and Pamitā, sister of the Buddha's father, King Śuddhodana. She was born on same day in the month of "Vaishaka" as Prince Siddaratha. Her grandfather was Añjana a Koliya chief, her father was Suppabuddha and her mother, Pamitā, came from a Shakya family. The Shakya and the Koliya were branches of the Ādicca or Ikshvaku dynasty. There were no other families considered equal to them in the region and therefore members of these two royal families married only among themselves. She was wedded to her cousin, the Shakya prince Siddhartha, in his 16th year when she was also 16 years of age. At the age of 29, she gave birth to their only child, a boy named Rāhula. On the day of his birth, the Prince left the palace. Yaśodharā was devastated and overcome with grief. Hearing that her husband was leading a holy life, she emulated him by removing her jewellery, wearing a plain yellow robe and eating only one meal a day. Although relatives sent her messages to say that they would maintain her, she did not take up those offers. Several princes sought her hand but she rejected the proposals. Throughout his six-year absence, Princess Yaśodharā followed the news of his actions closely. 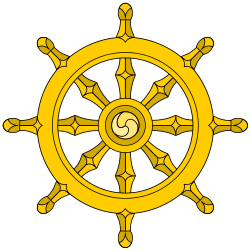 When the Buddha visited Kapilavastu after enlightenment, Yaśodharā did not go to see her former husband but ask Rahula to go to Buddha to seek inheritance. For herself, she thought: "Surely if I have gained any virtue at all the Lord will come to my presence." In order to fulfill her wish Buddha came into her presence and admired her patience and sacrifice will helped him to fulfill his wishes not in this birth but also in previous birth, by quoting Chandrakinnara Jathakaya. In the Chinese: 佛本行集經, The Collective Sutra of the Buddha's Past Acts, Yashodharā meets Siddhārtha Gautama for the first time in a previous life, when as the young brahmin Sumedha Buddha, he is formally identified as a future Buddha by the buddha of that era, Dīpankara Buddha. Waiting in the city of Paduma for Dīpankara Buddha, he tries to buy flowers as an offering but soon learns that the king already bought all the flowers for his own offering. Yet, as Dipankara is approaching, Sumedha spots a girl named Sumidha (or Bhadra) holding eight lotuses in her hands. 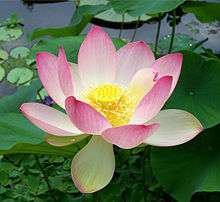 He speaks to her with the intention of buying one of her flowers, but she recognises at once his potential and offers him five of the lotuses if he would promise that they would become husband and wife in all their next existences. The meaning of the name Yaśodhara (Sanskrit) [from yaśas "glory, splendour" + dhara "bearing" from the verbal root dhri "to bear, support"] is Bearer of glory. The names she has been called besides Yashodhara are: Yashodhara Theri (doyenne Yashodhara), Bimbadevi, Bhaddakaccana and Rahulamata (mother of Rahula). In the Pali Canon, the name Yaśodharā is not found; there are two references to Bhaddakaccānā.